Hello crafty friends welcome back! Hope your New Year is off to a great start! 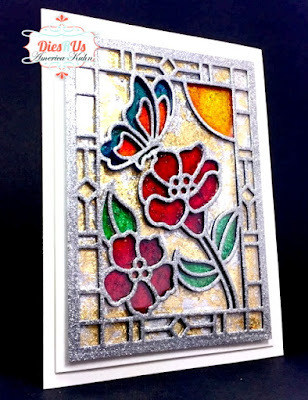 Today I'm sharing a set of Stained Glass Effect Cards created with Sue Wilson's fabulous dies), for my DT post found at DRU's Inspirational Blog! 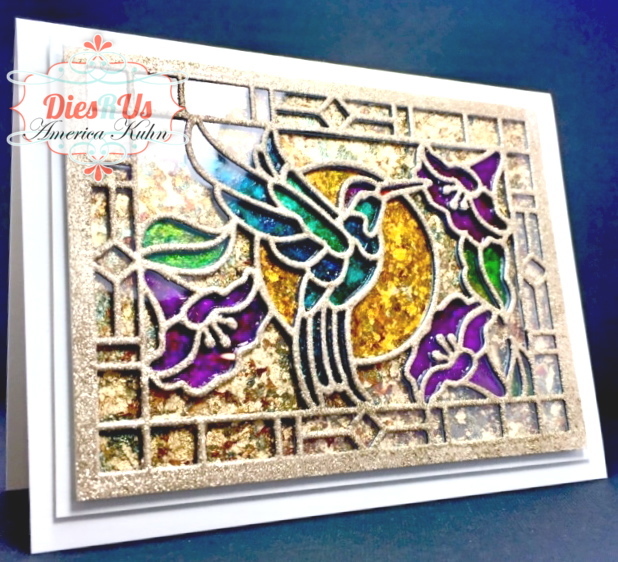 This First card features the Hummingbird die from Sue Wilson's Stained Glass Collection and the Mosaic Bauble Die (from Sue Wilson's Festive Collection). All cuts are multi-layered for dimension. 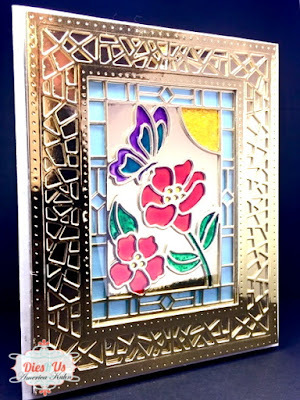 The outer Mosaic frame pattern added so much interest to the stained glass look. It's cut from Silver Mirrored Cardstock. The sparkly background panel was first adhered to double-sided sticky sheets then sprinkled with Iced Snow Gliter Jewels, then added the liquid coloring tints over glitter. This gives it a fab textured sparkly look. Lastly, an acetate piece was added under the top layered frame for the stained glass look. This Second card is done is mostly Gold also uses the Hummingbird Die that's been cut multiple times and layered for dimension. The very first layer was sprayed with adhesive and layered over a panel that was previously Gilded with Gilding Flakes. This created a lovely textured background. I then colored in the sections of the diecut with CE's select liquid coloring tints, blending the colors and re-coloring for deeper, richer tones. The top framed layer was cut from a Gold Glitter Kissed Sheet - (was good for adding more sparkle and texture). I finsihed the glass look with an acetate piece (cut to fit the frame) placed under the top layer. The Third Card iss done in silver and features the Butterfly die from Sue Wilson's Stained Glass Collection. Also multi-layered for depth (and multi layering after coloring also helps with covering-up/hiding any coloring mishaps). The background panel was cut from a Gilded Flake Sheet. The coloring was done with liquid tints over the flakes. (For a richer tone, you might like to color then let dry a few mibnutes and then reapply colors). The top layer cut was cut from a Silver Glitter Kissed Sheet for added texture. The silver also helped this colored background stand out. Acetate was adhered under the top frame for the glass look. The last Card also features the Butterfly die. It's framed with the Mosaic Bauble Die that's been cut and from Gold Mirrored Cardstock. The Cuts are multi-layered for depth (and again this also helps to cover any coloring mishaps). The background panel was adhered over Blue Cardstock for color contrast. Acetate was also adhered under the top frame for giving this the stained glass look. That's it! These were so much fun to put together! Creative Expressions Gold & Silver Mirrored Cardstock & Sky Blue cardstock Paper. White, Black Cardstock. CE's new Colouring Tints, Gilding Flakes and Glitter Kiss. For more inspiration, please stop by the Dies R Us links are provided below. Cute Card Thursday - What's New? That's it! These stained glass were so much fun to put together! What do you think? Which was your favorite? Would love to hear from you! they are all gorgeous. Can't pick a favorite. A beautiful set of cards here. I haven't seen a stained glass image on a card for a long time - it was once one of my fetishes and I had loads of SG images, but I let them all go...maybe I shouldn't have, lol. Thank you for sharing your beautiful card with us at Try it on Tuesday for our New or Old challenge. Love the stained glass effect. Thanks so much for playing along at The Male Room craft challenge. Good Luck! These are all just absolutely stunning America! And yes, they sure do sparkle! LOL AWESOME creations my friend! Thanks so much for joining us at The Sisterhood’s ‘Make It Sparkle’ challenge and please come back again soon! oh wow, your cards are stunning! What a beautiful set of cards! Bravo!!! Wow. Stunning work. It must have taken you a long time to colour these beauties. A labour of love. Just so beautiful! A fantastic set of cards! Thank you very much for joining us at Try It On Tuesday ! Amazing cards, as always, America. You are such a great inspiration, my dear friend. A wonderful set of stained glass window design cards. Thank you for sharing with us at Try it on Tuesdays. Oh WoW !! Super stunning cards. These are just stunning. Thanks for joining our glitter or foil challenge at Die Cuttin' Divas. WOW, these are all Gorgeous!! Love those dies and how you used them!~ makes them so special. 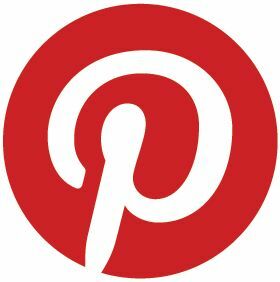 Thank you for linking up at IMAGINE THAT CREATIVE PLAYGROUND!! Breathtaking and gorgeous! Great papers and card design! We would love to have one of your projects submitted for an upcoming issue of the magazine! Thank you so much for entering the challenge at Through The Craft Room Door this week. Looking forward to seeing you again in the next challenge. Wow..your cards are stunning !! Loved the stained glass look ! Colors paired with gold look beautiful. Wow!! These are amazing!! Thank you so much for sharing your talent with us at Lemon Shortbread Challenge Blog. I hope you can join us again soon. Those cards are absolutely gorgeous. Thank you for joining us on the Creative Knockouts Challenge Blog. Wow! Amazing projects you've created. Thanks for playing along with us at The Male Room. Looking forward to seeing your creative projects in the future galleries again. What a beautiful stained glass effect you have created for your projects! Thank you for joining us at the Male Room for this fun Anything Goes challenge! These are such beautiful cards! 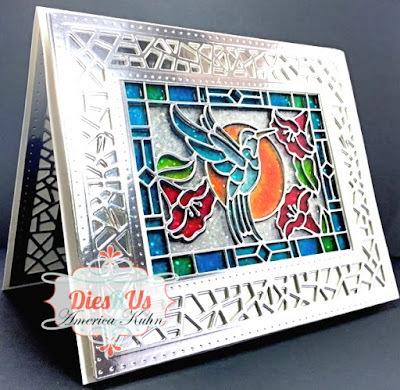 The foiled papers are a gorgeous touch to the stained glass look! Thank you for joining us Paper Girls in our challenge this week! Hi,your card is beautiful but sorry not clean and simple. Hope to see you again. Thank-you for joining us at the Crafts Galore Encore Challenge January "ATG" an sorry for the late comment.